Dimac Tooling, Australia and New Zealand's leading supplier of accessories and work holding solutions for CNC milling and CNC turning machine tools, is now able to offer CNC machine operators a unique retrofit automation solution to improve both productivity and efficiency whilst protecting the finished product. This is achieved through a Hydrafeed Barfeeder and a Royal Rota Rack working in conjunction. Hydrafeed, a UK based company,has established a reputation for designing and building a range of Barfeeders that offer unrivalled performance and accuracy, plus a user friendly set-up. 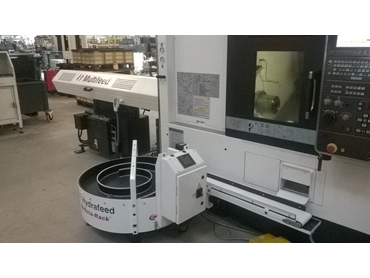 “Hydrafeed Barfeeders increase the productivity of any CNC turning centre and can be retrofitted to any entry level CNC machine as well as multi-tasking turning centres. This provides a solution for increased productivity from your machine tool,” said Dimac Managing Director, Paul Fowler. Standard features include complete servo control on all axes, fully automated set-up through a user friendly HMI screen and the versatility to accommodate different bar diameters and lengths including random bar lengths. 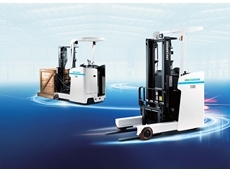 A wide variety of models are available to suit any application. Rota-Rack is a lean, cost-effective device that safely collects finished parts as they come off a CNC lathe, providing a competitive advantage to manufacturers by enabling their machine tools to run unattended for extended periods of time. Rota-Rack is manufactured in the USA by Royal Products. For more than 65 years, Royal Products has been designing and building precision metal working accessories to help manufacturers squeeze every last drop of performance out of their machine tools. “Equipping your bar-fed CNC lathes with a Rota-Rack enables you to continue making parts long after the last employee leaves for the night or weekend. Crucially, it eliminates parts damage and can give you up to ten extra hours of unmanned production every single day,” Dimac Managing Director, Paul Fowler pointed out. One of the most important aspects of the Rota-Rack is that no machine interface is required, electrical or mechanical;the unit simply plugs into a 240v ac outlet and the operator sets the index functions with a simple touch-screen PLC. The unique rotary spiral gently guides finished parts to the centre as the turntable rotates, whilst a low-friction UHMW material covers all contact surfaces for superior part protection. The Royal Rota-Rack is especially good at protecting straight edges of milled parts – often a difficult task with other collection methods. In addition, its universal height- adjustable design adapts to virtually all CNC lathes. Importantly, the Rota-Rack can be powered using the Hydrafeed Barfeeder’s existing power source. “Quite simply, for a CNC Machine tool owner the combination of a Hydrafeed Barfeeder and Royal Rota-Rack is a marriage made in heaven. It’s easy to retrofit and will add a massive dose of productivity, keep your machines running long after your last employee has left for the night or weekend and improve your competitiveness in the market,” Mr Fowler added. “The combination of a Hydrafeed Barfeeder and Royal Rota-Rack will ensure the highest quality of the finished product and typically pay for themselves within a reasonably short time frame,” concluded Mr Fowler.